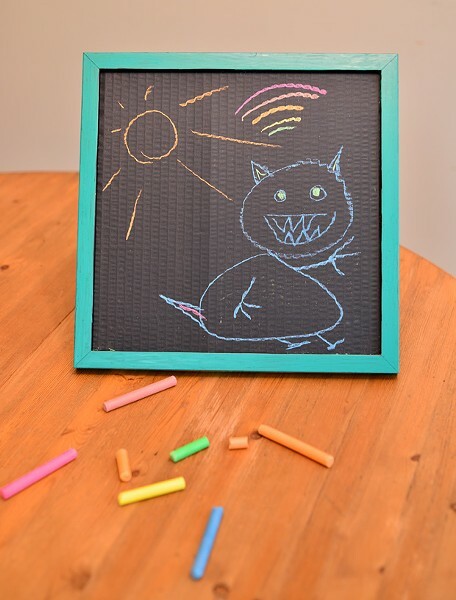 Framed Chalkboard | Project | Kids VT - small people, big ideas! Smartboards are standard in classrooms these days, but good old-fashioned chalkboards are still handy at home. Kids can use these easily erasable surfaces to practice their ABCs and improve their artistic skills. Start the school year with a clean slate by repurposing a thrift-store photo frame for this simple, speedy craft. It'll be ready to use as soon as the paint is dry. Cover your workspace with sheets of newspaper. If desired, paint or decorate the frame with acrylic paint. Paint one side of the cardboard with chalkboard paint. When everything is completely dry, secure the painted cardboard into the frame. It's ready for chalk! To wipe the chalkboard clean, run a damp paper towel over it and let the board dry before using again.